Karen Røise Kielland’s A Slow Escape is one of seven works presented as part of a new dance festival in London, Fest en Fest, organized and curated by Hanna Gillgren and Heidi Rustgaard of H2Dance. The festival aims to question ‘choreographic practice, the context for art production, current programming and aesthetic power structures’ through a series of talks, discussions and performances. In this first outing of the festival Gillgren, who is Swedish, and Rustgaard, who is Norwegian, have chosen works that arise from a predominantly Nordic geography and sensibility, none more so than A Slow Escape. It is based on two walks from Norway to Italy, one by Catherine H. Kølle in 1841 and the second by Kielland in 2011 following as closely as possible in Kølle’s footsteps. The evidence of Kølle’s trip — and the primary source for Kielland’s own — is contained in her diary of meticulous details like the colour of roofs, the topography or the number of paintings in a museum. 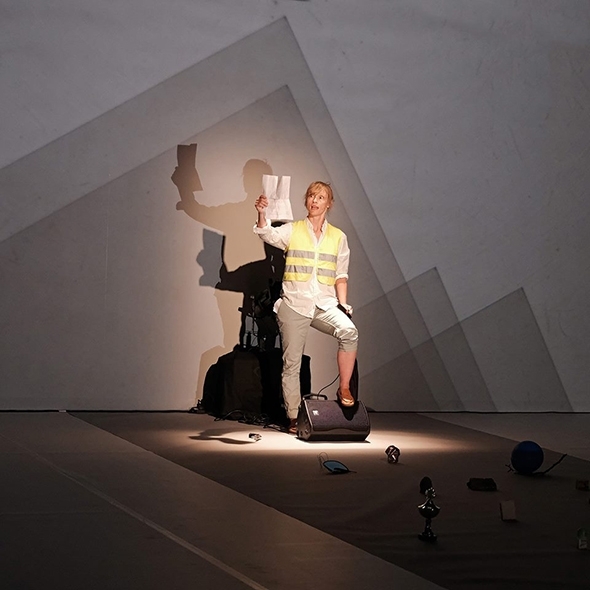 The evidence for Kielland’s walk is contained in her edited field recordings, her spoken travelogue and an exhibition of mnemonic artifacts on the stage in front of her. Kølle also painted a series of watercolours of her travels in a shorthand style that predates painting by numbers, a visual corroboration Kielland references by inviting artist Tom Mason to join her on stage with an overhead projector and a pile of acetates on which he illustrates her travels in the manner of a graphic novel. Kielland remains quite still throughout, poised as if chatting to the camera by the roadside with one foot resting on a stile, wearing a hazard jacket, holding a revolver in one hand and an umbrella in the other. We travel her entire journey in our imagination, fed by her pace of delivery, her walking guide to the history of Europe, her ongoing investigation into Kølle’s diaries — a historical riddle in itself — and by Mason’s imaginative fluency of line. It’s a brilliant collaborative adventure with dramaturgy by Marit Grimstad Egggen, advice from Christina Hauge, lighting by Ingeborg Staxrud Olerud, set and costume advice from Jennie Bringsaker and sound editing assistance from Erlend Hogstad. A Slow Escape is also a commentary on how Europe has evolved since Kølle set out on her journey. While headlines in the daily Morgenbladet paper on the morning of Kølle’s departure of April 4, 1841 cited an economic crisis in Greece, and again on June 19, 2011 when Kielland left on her trip, the social and geographic aspects had changedforever; routes that Kølle described were no longer available to Kielland because of the expansion of transport infrastructure and some villages Kølle had passed through had since been drowned by hydroelectric projects. She also encounters sites that Kølle had never even imagined like the abandoned airport of Templehof near Berlin. Kølle’s dispassionate numerical annotations are ever present next to and contrasted with Kielland’s own commentary. Her diary was written in German Gothic script that no researcher, it seems, had ever bothered to read. Kølle was known as Norway’s first hiker and her walk to and from Venice was considered a matter of irrefutable fact, even according to her biographer. Over the course of her journey, however, Kielland’s reading of the script becomes more fluent and as she matches her own experience with Kølle’s she realizes that the diary includes passages about riding in coaches for some of the way. Her entire adventure, it seems, is based on a false premise. Her sense of deception on her arrival in Venice is aggravated by confounding the end of her project with the end of Europe as she had imagined it. Kielland conjures up a walking map of Europe at a time when people barely walk any distance at all; she says at one point in her travelogue that she hasn’t met a soul all day and imagines Kølle having more people from whom to ask the way: ‘there is company in a voice,’ she observes. The act of talking mediates between mind and body and although she remains static for most of the performance — a remarkable endurance test in itself — Kielland’s words succeed in connecting us to the journey of the walking body she describes. A Slow Escape is thus the record of an ambulatory dance on the geographical scale of Europe that Kielland has compressed in all its richness to a small stage in Deptford at a time when the British government is in the very process of redrawing the map yet again.